Have you ever heard of Biddy Chambers? Probably not. She's not exactly a famous woman, even in Christian circles, but her work has had an incredible influence on millions of people trying to live the way God wants us to live. Biddy was a stenographer. That's not an occupation most of us would associate with inspiring people to live more godly lives, and yet it was her stenography skills that God used. A stenographer writes in shorthand, keeping notes while someone else talks. You might picture the stereotype of a secretary taking notes while her employer dictated a letter. Biddy wasn't taking notes for her employer though, she was transcribing her husband's sermons as he preached. Her husband was Oswald Chambers, whose books have sold millions of copies. The funny thing is, Oswald Chambers died without having written most of the books now published under his name. The work contained in the books is his, but he wasn't the one who set it to paper. That was Biddy's work. She took her shorthand notes and then, after his death, compiled them first into pamphlets and then eventually into books. My Utmost for His Highest, Chambers' most famous book, was published from Biddy's notes 10 years after his death and has never been out of print since. Many of us feel we don't have much to offer in terms of serving God. We think of pastors, musicians and authors and we can see how their skills can be used to bring people to God, or to help Christians live the way God intends for us to live. But we tend to think along the lines of, "But I'm just a _________. God doesn't need me." If Biddy Chambers had not used her stenography to serve her God, the world would be missing out on the books she helped to produce. Oswald was a preacher, a much more obvious occupation for God to use, but without Biddy's efforts, most people would never have learned from Oswald's insight and teaching. His words certainly wouldn't be on my bookshelf, and maybe even yours, without her work. For a couple of years now I have been drawn to chapter 12 of 1 Corinthians. I feel like it is the message God wants me to share with those who believe in Him. This chapter isn't meant for evangelism, for telling people about Jesus and bringing them to repentance. This chapter is meant for believers, for those who already know Jesus and want to serve Him. God wants us to fully understand that He has given us the talents and abilities we need to serve Him. We aren't good at the same things, and that's by His design. He doesn't want us all doing the same work. If we all try to do one job then the other jobs won't get done. In 1 Corinthians 12: 4-6, Paul writes, "There are different kinds of gifts, but the same Spirit. There are different kinds of service, but the same Lord. There are different kinds of working, but the same God works all of them in all men." God doesn't only need pastors. He doesn't only need writers. He needs teachers and nurses and doctors and store clerks and bank tellers and secretaries. What we need to do is take an honest look at ourselves. Not a humble look, which says, "Well, I can do ________, but so-and-so does it much better," but rather an honest look at talents that may seem unlikely to be useful to God. 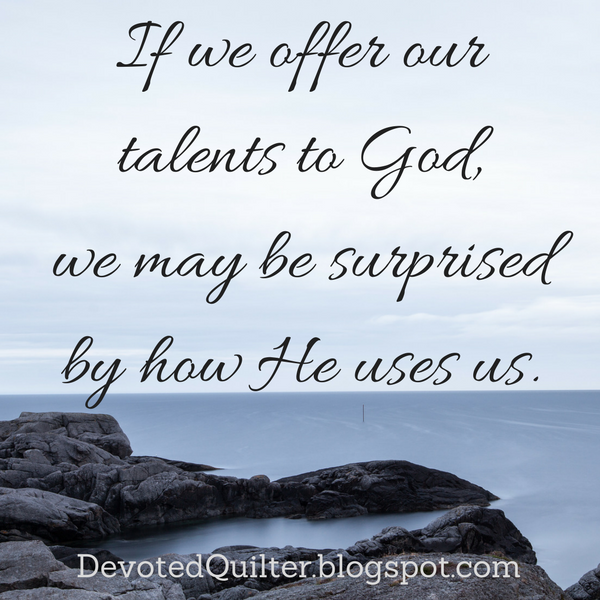 Then we need to offer those talents in service to Him in whatever ways He sees fit. We may be surprised by what He can do with what we consider unlikely skills.